Alpha-Stim 100 is a prescription medical device. It is a combined microcurrent electrical therapy (MET) and cranial electrotherapy stimulation (CES) device used to treat pain, anxiety, insomnia and depression. Over 126 research studies on CES have been done with humans. A peer reviewed published outcome study has shown improvements in pain in 94% of patients studied. An additional 29 studies were conducted with experimental animals to ensure safety and efficacy. The relief from Alpha-Stim is residual and cumulative, resulting in less frequent use. And while Alpha-Stim works well with other treatment protocols, it is proven effective as a stand-alone therapy, and does not require any drugs or create addiction. An animal’s body is made up of trillions of cells. Each cell has electrical properties, much like that of a battery. 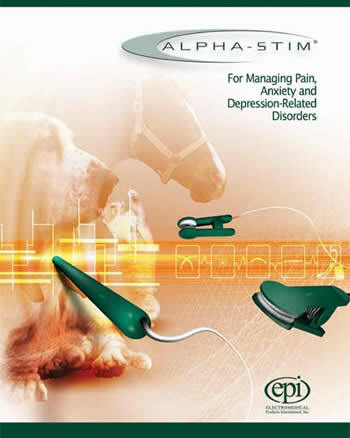 Alpha-Stim generates a unique, proprietary electrical wave-form that allows the animal’s cells to operate naturally and bring relief from pain, anxiety, insomnia or depression. This proprietary waveform moves electrons throughout the animal’s body and brain at a variety of frequencies, collectively known as harmonic resonance. Alpha-Stim was introduced in 1981 and has since provided millions of people around the world relief, even when nothing else has worked for them. Extensive work with animals – there are 29 published animal studies – shows positive results with no significant lasting side effects. With 55 completed research studies – and many more underway – there is more research supporting the efficacy of Alpha-Stim technology than any other medical device and even more than for most drugs. An important fact about Alpha-Stim research is that none of it is company-supported. Most of the studies are double blind placebo controlled and were conducted at major US universities. The US government has funded two major Alpha-Stim studies. One is a National Cancer Institute/National Institutes of Health funded study for breast cancer patients undergoing chemotherapy and the other is a VA study for veterans with spinal cord injuries based on a successful pilot study A comprehensive, double-blind equine study was conducted of the stress reduction effects of Alpha-Stim with 8 thoroughbred horses (2 fillies, 3 mares, 3 geldings) at the De Montfort University Equestiran Centre and Field Station at Caythorpe, Lincolnshire, United Kingdom. This study concluded that the results are consistent with beneficial effects using the Alpha-Stim. Effects were seen on the behaviors of greatest relevance to assessing anxious arousal in the given circumstances, namely time spent alert and dozing, and a number of other parameters consistent with relaxation. Specifically, there was no significant increase in any parameter associated with excitement nor was there any evidence that Alpha-Stim has any detrimental effects on the horses’ well being. How Do I Use Alpha-Stim in My Veterinary Practice? There are two primary ways to use Alpha-Stim within your practice: 1) as an animal treatment procedure during veterinary doctor visits; and 2) Selling (e.g., for chronic disorders) or renting (e.g., for postoperative pain) Alpha-Stim to the animal owner who would then use it on the patient. Alpha-Stim uses a method called cranial electrotherapy stimulation (CES) to treat anxiety, insomnia and depression. 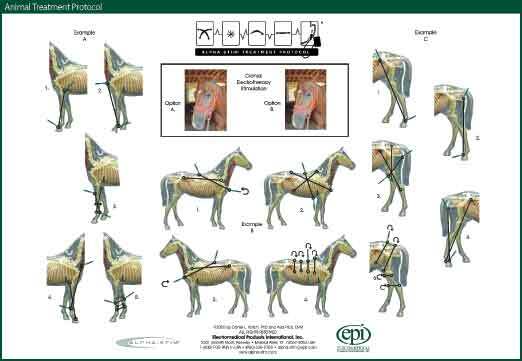 The Alpha-Stim proprietary waveform is applied to the animal through ear clip electrodes [note: self-adhesive electrodes are also available and can be applied to the temple area for the same results]. A typical CES session lasts 20 minutes, leaving the animal relaxed and alert. Alpha-Stim is also used to treat pain using microcurrent electrical therapy (MET). Animals suffering from acute, chronic or post-operative pain may experience relief from Alpha-Stim by applying the probes or self-adhesive electrodes to the affected area. You can prescribe an Alpha-Stim for the pet owner, who purchases an Alpha-Stim from you, and in turn administers Alpha-Stim to their pet. Alpha-Stim comes with a complete set of instructions, as well as protocol diagrams to ensure the proper placement of ear clips, probes and/or self-adhesive electrodes. It’s safe. It’s effective. It’s painless. It lasts. As a licensed veterinarian, you can experience the soothing effects yourself and immediately recognize how Alpha-Stim can help your animals and veterinary practice. Simply call us today. You will be connected to one of our experienced and knowledgeable clinical support specialists who will be happy to answer any further questions. Then, you will be contacted by an authorized Alpha-Stim distributor who can demonstrate Alpha-Stim in your office, and show you how to use it on animals. Your distributor will be able to provide valuable insights and suggestions on how to effectively integrate Alpha-Stim into your practice and introduce it to your patients. You owe it to yourself and your patients to try Alpha-Stim and see for yourself. Call us today and let your patients experience life again. One 9 volt battery (included). Replace with disposable batteries (alkaline preferred). Probe (10 seconds on, alternating with 2 seconds off), 10, 20, 60 minutes, and continuous. 10 to 600 µA continuously adjustable.Frequency0.5, 1.5, or 100 Hz (pulses per second). Five Year Warranty: Each Alpha-Stim®100 is warranted to be free from defects in materials and workmanship under normal use for a period of five years except for replacement of batteries and accessories. See Owner’s Manual for complete details. CE conformity statement for Europe: Alpha-Stim®100 is a class IIa, Type B medical device. It has been independently tested by outside agencies in order to provide assurance of conformity to applicable standards for medical equipment safety and electromagnetic compliance. Caution statement for United States: Federal Law (USA only) restricts this device to sale by, or on the order of a licensed health care practitioner. Outside of the USA it is available worldwide without a prescription but consultation with a qualified healthcare professional is recommended. Indications: Alpha-Stim®100 is an effective treatment with broad applications for a variety of syndromes involving pain, and for the management of anxiety, depression, and/or insomnia, or for the short term relief of the symptoms of pain, anxiety, depression and/or insomnia. In many cases it is the sole therapeutic method required. Effective results in pain management have been seen during and/or subsequent to stimulation over affected body parts, adjacent areas, and areas distant from those in pain. As with any therapeutic intervention, not all animals will respond to Alpha-Stim®100.The degree of efficacy will vary with the nature of the problem being treated, the overall health of the animal, and with the method of treatment. Contraindications: Do not stimulate directly on the eyes or over the carotid sinus. Precautions: For external use only. Do not allow children to use or handle this device without adult supervision. Safety of stimulation has not been established during pregnancy. Adverse Effects: Adverse effects are usually mild and self-limiting. Adverse effects seen in approximately 4,541 human patients in controlled open, uncontrolled conditions, and by physician survey and reasonably associated with the use of CES are dizziness (6 cases, 0.13%), skin irritation/electrode burns (5 cases, 0.11%), and headaches (9 cases,0.20%). Prolonged CES treatment at higher than necessary currents may cause dizziness or nausea that can last from hours to days. Paradoxical reactions such as hyper excited states, increased anxiety, and sleep disturbances may occur.